PVL president Ricky Palou, left, and Tats Suzara of the Superliga have traded barbs over the long delay in the issuance of ITCS to PVL imports. PHILIPPINE Super Liga (PSL) president Ramon ‘Tats’ Suzara on Monday strongly denied he had a hand in the failure of the Premier Volleyball League (PVL) to obtain international transfer certificates (ITCs) for its imports. 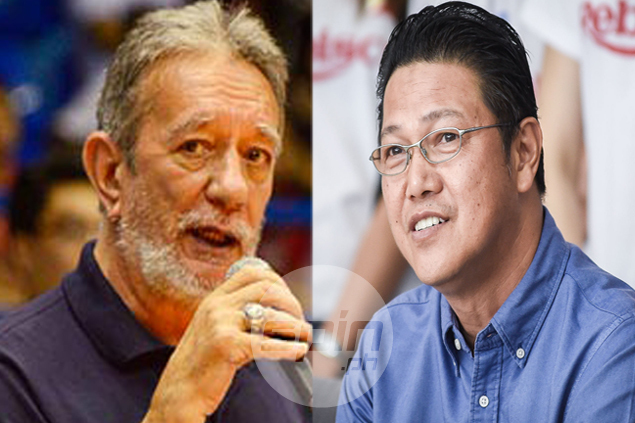 Suzara said he is not to blame for the inability of the PVL to obtain the ITCs which the imports need to play in the ongoing Reinforced Conference, insisting that securing the ITC is the main responsibility of the league, in this case, the PVL. Suzara has come under fire on social media, accused of having a hand in the long-delayed issuance of the ITCs of PVL imports in the Reinforced Conference. A hashtag of #IbigayMoNaTatsSuzara was also posted on Twitter by a few PVL players on social media. He passed the blame to PVL president Ricky Palou, who he said should be aware of the rules and regulations regarding ITCs as contained in the FIVB’s Electronic International Procedure Manual. Based on the FIVB manual, Suzara pointed out the transfer of foreign players should not be within the period from October 15, 2016 to May 15, 2017. The opening of the PVL Reinforced Conference falls during the said period. “Either Palou was unaware of that calendar, which is well known among professionals and serious volleyball officials, or just chose to ignore it hoping that the LVPI or I would pressure the FIVB to exempt the PVL from the FIVB's sacred rules,” said Suzara in a statement. “Palou may have given inaccurate information to the PVL players, volleyball fans, PVL team owners, its TV partner and other media into laying the blame on me, or the PSL, or the LVPI as the culprits and villains who caused this mess Palou inflicted on himself and the PVL,” Suzara said. “I am afraid that if PVL fails to obtain these permits on time and shoot themselves on the foot again, PSL or the LVPI and maybe I would be blamed again,” he said. Suzara also demanded an apology from the players who made the accusations on Twitter. “I hope, for the sake of the PVL team owners, TV partners, sponsors, fans and players including those who went to social media without checking their facts, this problem which PVL itself created is resolved soonest,” Suzara added. “I demand an apology from players who jumped into the fray and accused of me of bullying them without checking basic facts,” said Suzara. Suzara also said the PSL should also be allowed to work on its task of preparing a team to the Asian Women’s Club Championship in Kazakhstan. “Our country does not need these distractions which are intended to cover up for the negligence and incompetence of supposed volleyball officials,” said Suzara.